The New York Times is floating the suggestion that Glenn Beck’s program on Fox is on thin ice with the network and his contract may not be renewed when it comes up this year. Do you believe it? Me neither. It is just wishful thinking. Liberals hate Glenn Beck almost without being able to articulate why. Most simply call him names or attack his personal traits or character. I wish I had a dollar for every time somebody mocked Beck for crying on-air. It sort of sets up the dividing line, doesn’t it? His detractors mock Glenn Beck for crying on-air. His supporters cry with him as they realize what he is saying is true. I don’t want to get into defending Fox News personalities – that isn’t the point. The point is that when it comes to Fox News, if the truth gets in the way, the New York Times is more than willing to step over it. Bill O’Reilly is many things, but one thing he is not is a conservative. He claims to be a registered Independent. I frankly believe his sympathies lie more with the Left than with the Right, but he is fair enough in his approach that one can never be quite sure. Sean Hannity is clearly and unapologetically a Republican partisan spin doctor. Hannity makes no claim of being fair and balanced – he dropped any pretense of bipartisanship when he and the deeply-annoying Alan Colmes parted ways. You never see them together on a program or interviewing one another. There is a reason for that. O’Reilly and Hannity don’t belong in the same room. On the other hand, Beck is a regular guest on O’Reilly. It isn’t that O’Reilly is saying the same things – O’Reilly regularly mocks Beck and his conclusions. Beck isn’t a partisan, either. The degree that he appears to tilt to the right is the degree to which he makes no pretense of his horror at the direction taken by the left. But Beck’s beef is with progressivism, which is neither Republican nor Democrat, left or right. Progressivism baffles O’Reilly – if anything, he seems bemused by it all. For example, Teddy Roosevelt was one of the great Republican presidential heroes of history. Roosevelt was also a dyed-in-the-wool Progressive. He helped fellow Progressive Woodrow Wilson, a Democrat, win the White House when he broke with the GOP during the 1912 Election to run as a candidate under the “Bull Moose” Party. Roosevelt’s Bull Moose Party’s social programs were similar to those of Wilson: women's suffrage, social welfare assistance for women and children, farm relief, revisions in banking, health insurance in industries, and worker's compensation and an easier method to amend the constitution. Roosevelt wrapped it all up in the American flag and split the vote, which enabled Wilson to win with a 43% plurality. Had Roosevelt not split the vote, Taft would probably have won by a landslide, the Federeal Reserve would probably not exist and we probably would not have either a progressive income tax or an Internal Revenue Service. That is a lot of "probablys", but they are all probably right. Taft was firmly against all three. These things are important to understand if one is to understand what Mr. Carr and the New York Times is trying to say about Glenn Beck or Fox News. The Times’ column is a masterpiece of propaganda. Allow me to offer one glaring example. Anonymously, of course. Why anonymously? Because it’s a lie. What? There is a cable news show host that wouldn’t like to outdraw all his competition combined? So, of course Carr’s source is anonymous. Any network official that would tell the NYTimes they are thinking of firing their number one cable ratings draw because he offends a segment of the population that doesn’t even watch the program would have to remain anonymous - to keep Carr’s narrative intact. “Unlike some other cable hosts, Mr. Beck has a huge multiplatform presence: he has sold around four million books, is near the top of talk-radio ratings, has a growing Web site called The Blaze, along with a stage performance that still packs houses. Forbes estimated that his company, Mercury Radio Arts, had more than $30 million in revenue. Fox is having difficulty hanging on to its credibility as a news network - this is written down as a purported fact? Is he kidding? Is it not the number one most-watched most highly-rated cable news network in the world? What exactly is the problem with Glenn Beck that has the New York Times lamenting his soon demise? Since Carr is one of the journalists that Beck was referring to, Carr didn’t get the irony. Let me first say that I don’t watch Glenn Beck every day. And I don’t want to appear as if I am defending Glenn Beck, the person. That is precisely the way that guys like Carr and publications like the New York Times want the debate to be framed. If they can frame the debate about Glenn Beck the person, then they needn’t address the issues he raises, (which is why I found it so ironic that Carr concluded his piece by blissfully quoting an indictment that so clearly includes Carr). On the other side of the coin are those who marginalize Beck on religious grounds because he is a Mormon. If he can be discredited because he is a Mormon, then nobody need address the issues he raises . . . because he is a Mormon. You see how brilliant it is. Take today’s Omega Letter. It isn’t a defense of Glenn Beck, exactly. It sounds like it is, but what it is supposed to be is a defense of the truth of what he says. But the New York Times’ piece didn’t attack the truth – it ignored the truth to attack the truth-tellers. Could it be possible that nobody fact-checks Glenn Beck? It seems unlikely. So look around the Internet for reports from those who claim that they have. The biggest mistake Beck’s attackers ever made was to go after his ‘misrepresentations.’ Everybody makes mistakes from time to time. Making a mistake on a detail is not the same as being wrong on the whole premise. There are literally tons of sites that attack him for misquoting mostly-irrelevant dates or figures - and one that takes him to task for criticizing Obama’s use of a teleprompter when Beck himself uses one on his television show. I’m not making this up. That is what qualifies for a rebuttal for Beck's contentions about the role of the Money Trust, the selling out of America by the administration, the background information about ‘czars’ like Van Jones, John Holdren, Cass Sunstein, Carol Browner and so on. If Beck gets fact-checked about his teleprompter, then what is illuminative are the facts that AREN’T disputed by the White House. Beck is able to do five one-hour shows a week on his material, while legions of unfriendly fact-checkers struggle to come up with a single disprovable fact they can point to. What is disturbing about Glenn Beck? Is it those things the left can identify as ‘factual misrepresentations’? Or is it the things that it cannot? The attack on Glenn Beck, like the attack on Fox News, is a substitute for an attack on the facts it presents. The New York Times’ hit piece is aimed at the personalities, not the information, because the information is true. As I said at the outset, I don’t want this to be seen as a defense of Glenn Beck or a defense of Fox News. 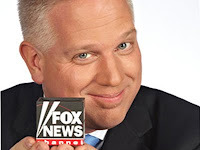 The attacks are against Glenn Beck – nary a word is wasted on trying to disprove his charges. The White House launched an all out war against Fox News last year, going so far as to question its claim to be a news organization, but not once contesting the facts that prompted the criticism. There is an old saying that aptly describes the efforts being directed against Glenn Beck individually and against Fox News corporately. It’s called “shooting the messenger.” Why? Because they can’t control the message. But I don’t think the Apostle was necessarily referring to Fox News. Although he may have been referring to reporters that can't tell the difference between Charlie Sheen and Glenn Beck.